Fly Types by Chris Cook. There are four main types of fly used in trout fly fishing which are described below. Dry flies can be either imitative or suggestive. An imitative dry fly is tied to copy an exact fly found on the water such as a Daddy Long Legs or Mayfly. 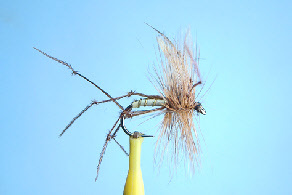 A suggestive dry fly is tied to suggest a number of food items that appear on the water but not one item in particular, such as the Humpy or Wulff. 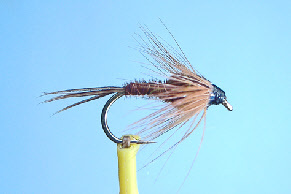 Dry flies typically have a hackle at the front of the fly which helps the fly to float on the water. Materials such as CDC and Deer or Elk Hair are also commonly used to keep the fly on the surface. Dry flies are usually used during spring to autumn when the weather is warm but there are times during the winter when fish can be taken on them. Certain temperatures trigger hatches of insects at certain times of the day and this is when imitative flies should be used to mimic the exact fly that is hatching. Products such as Gink can be applied to the fly to aid the buoyancy. Nymphs are tied to imitate or suggest small invertebrates found within the water. Imitative nymphs include Damsel Nymphs, Mayfly Nymphs and the Corixa. Suggestive nymphs include the Pheasant Tail Nymph, Gold Ribbed Hares Ear and the Prince Nymph. For a fly to be imitative it must not only be the same colour and shape, but must also be the same size as the insect being imitated. 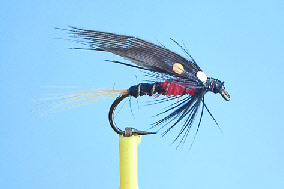 Depending on the depth at which the fly is to be used willl dictate the amount of additional weight to be added with the use of a lead underbody or tungsten/gold beads at the head. Nymphs are found in both rivers and stillwaters; in both they tend to be at the bottom as well as amongst weed beds and stones. 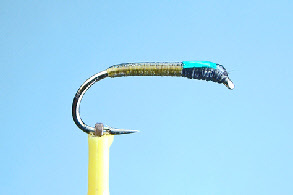 Buzzers are also referred to as chironomid, they come in to their own during the summer but will work all year round. There are buzzers designed to fish at every depth ranging from CDC and Shipmans Buzzers that will float in the film all the way through to buzzers tied on heavyweight carp hooks which will get deep quickly. There are numerous ways to fish them; they can be left them static with or without a sight indicator, they can be retrieved using a very slow figure of eight or they can le left to drift round with the wind. As with all other types of fly, there are popular colour combinations for buzzers - the most popular ones include a black body with yellow or orange cheeks. Holographic or UV ribs can also be added to the flies to imitate the segmented body found on the natural. Traditional Irish and Scottish Wet Flies are used on both rivers and stillwaters and are often fished as a 'team' of flies (more than one fly on the cast). In a river they are fished down and across, on a stillwater they can be fished various ways. 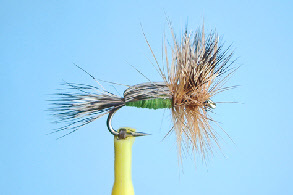 There are many types of wet fly ranging from bushy to slim ones, and from size 8 to size 18. 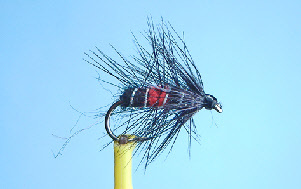 Some have front hackles such as the Bloody Butcher and some have palmered hackles such as the Soldier Palmer which create different amounts of disturbance and fish at different depths in the water. 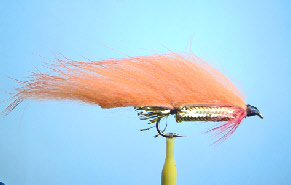 Also called Streamers in some countries, lures are designed to spark aggression in a fish through a colour pattern or through movement in the tail and wing by using materials such as Marabou. Lures can also be imitative in the case of fry patterns during months when fry are in large numbers. Whilst many lures are retrieved quickly, there are plenty of lures that can be fished very slow or even left static such as the Booby. Popular colour patterns for lures are white and yellow or black and green.